Is There WiFi at the Event Location? Yes. The event location offers free WiFi that our exhibitors may use. However there is no guarantee that the WiFi will be available at all times or that your device will be able to connect to the free WiFi. If you rely solely on the free WiFi to take payments at the show you do so at your own risk. Neither the Mississippi Craft Show or the event location will guarantee the availability of the WiFi service. Can I select my booth space? Exhibitors may select which booth type you would like on your application form. (Please see the FAQ ‘Booth Types” for a description of each. It is simply not possible or practical for exhibitors to select their booth location. We spend a great deal of time making sure that similar booths are not located too close to each other. We ensure that incompatible booths are not next to each other. We do our best to place booths near to any other exhibitor if they have requested it. We spend more time than you would imagine planning the best layout possible, keeping all of these things in mind and working within the constraints of each exhibitor’s booth selection. Allowing exhibitors to select a booth location indiscriminately is not practical and would have a negative impact on the entire show. There are a number of things that need to be considered in show layout – we actually take into consideration things like how shoppers peruse the walkways. The psychology of shopper behavior, and more. You would be hard pressed to find any other show that spends as much time planning show layout with the interests of the exhibitors at heart. We have a referral program as a way to say thank you to our loyal exhibitors. If you are a previous exhibitor who has attended any past Mississippi Craft Show or Handmade USA Show and you sign up for the August MS Craft Show before March 15th you can now reap the benefits of your referrals. If you refer a new exhibitor who applies and is accepted to the show we will credit you $25 for each successful referral. To earn the $25 thank you credit you must be a previous exhibitor and you must have already applied (or will apply) for the August MS Craft Show on or before March 15. You may refer as many people as you wish. You will be credited with $25 toward the cost of your own booth for each successful referral. The only limit is we will only credit you up to the cost of your own booth. (If your booth is $375 we will credit you up to $375). * A NEW exhibitor (someone who has not attended previously). * Who is accepted to the show and pays their fees. * Who enters your name or your business name in the referral area on the application form. (Referral names can not be added after the application has been submitted). If you are having trouble registering on the site, or problems submitting the application form, contact us via email and we will assist you. If you are accessing the site on a mobile device please try again on a computer first as some mobile devices can cause issues. If you are an exhibitor with questions about the MS Craft Show Show please check the FAQ section and Show Rules pages. Links to these pages are available on the Exhibitor Menu which is visible once you log in. If you have further questions please email for assistance and we will do our best to help you. If you are a shopper with questions, check the About page. If your question is not answered there please email and we will be glad to assist you. Please visit the Contact Page for full contact details. Question about social media promotions. 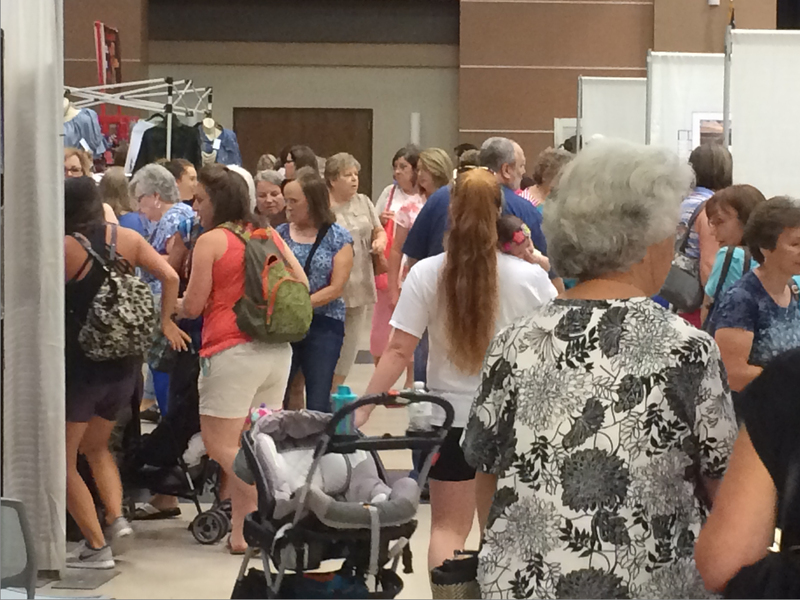 The Mississippi Craft Show’s Exhibitors may be promoted at any time throughout the year between shows on social media. Naturally promotion will be heightened leading up to a show. We make no guarantees of inclusion in this promotion. For best chance of inclusion please provide the photos and information we request from you by the deadlines specified. We will use whatever images and information we have at hand. The posts we make promoting our exhibitors will be made at random days and times and will be in no particular order. We may promote some exhibitors more times than others – this is part of the randomized listing, or because we have additional good quality images to use, and is not because of favoritism. Also, exhibitors who provide the information we request by the posted deadlines have a better chance of being featured in our promotions. GOOD PHOTOS = GOOD CHANCE to be listed. If we do not receive any photos or information by the deadline requested, or if we receive images that can not be used because they are not large enough, sharp enough or they do not adhere to our requirements, we may substitute our own photos of that exhibitor if available. If we do not have any of our own photos, and receive none from the exhibitor, we may have to exclude that exhibitor from the promotion rotation. Please DO NOT ask when your image will be posted to social media. We spend hours scheduling the photos, please simply keep watching and waiting – if you have provided the information and photos needed (as explained above) your turn will come. We simply do not have time to check the schedule for everyone to tell you when your photo(s) will publish. Please understand: If we have 80 exhibitors to promote not all photos will be posted on the same day, or the same week. We start promotion weeks before the show. BE PATIENT. We do our best to make sure everyone has a turn at being promoted. How do people get featured in the show magazine? Not everyone can have a feature article in the Magnolia State of Mind magazine (either printed or electronic, or promoted on our social media). We select exhibitors to feature as fairly as possible. If you have been featured the magazine the previous year, it would make no sense, and not be fair, to feature you again the following year. However, after a few issues you would be able to be considered once again. which exhibitors have been with us the longest and not yet been featured. Which exhibitors sent us really good photos that were print quality. Which exhibitors sent us product to photograph because they did not have good photos to send. Which exhibitors responded to our request for information on time. Essentially, the magazine is a visual item. There is no point writing a story if we do not have great photos to go with those words. People will only stop to read if they are first attracted by what they see. Part of that is magazine layout, but a larger part is simply good photos of the items the exhibitor makes. We may be able to write an amazing story about you, but if we have no photos, there is little point. The magazine is a HUGE undertaking. It takes weeks of long hour hour days to complete everything. We do the best we can to include everyone. Not everyone will be a feature story, not everyone will be happy with their listing, but ultimately we do the best we can with what we have to work with. If you want something specific included in the magazine about your items, you can purchase an advertisement spot and provide us with your camera ready art work. This method allows you to determine precisely how you want to be presented in the magazine. Exhibitors who apply late may not be included in the magazine due to the printing deadline. Exhibitors who do not provide print quality images may not be included in the magazine (unless we have our own photos to use). Exhibitors who fail to respond to our request for information or photos by the deadline may not be included in the magazine. Please remember you are included in the magazine for free, we make no money off the magazine as we provide it for free as part of our extensive promotion efforts, and it is a huge project for us to undertake. If you do not like your listing in the magazine please let us know as soon as possible. While we can not recall and reprint the hard copy, we will be happy to remove it from the on-line version. We generate tremendous excitement promoting our exhibitors for the MS Craft Show via social media. If you would like to be involved in the competition promotions please read the following. You can check our Facebook Page to see previous competitions. 1. You can join in on the competitions to direct people to your business and your Facebook or other social media page. We will post to both our main page and our event page on Facebook as well as other social media. See the example graphic posted on this page. You do not need to provide the competition graphic – we will make one for you. In fact, we handle everything. All you need do to is simply indicate on your application form that you would like to participate and what prize value you wish to offer. We will make the graphic and we will post the competition featuring your business and your prize voucher. The text that will go with the graphic will tag your page (where appropriate and possible), mention what products you offer, and ask people to visit your page and to visit you at the show. The prize is a shopping voucher of whatever amount you choose. Winners can shop at your booth and select what they like, this voucher will only be good for the weekend of the show – so the winner will need to attend the show to use this voucher. The Craft Show will select winners at random and will provide the vouchers for winners to collect at the show. No change will be given from a voucher so if a shopper buys something for $20 with a $25 voucher, they do not get the unused portion. You can select any amount for your prize $20 or more. The appropriate amount will depend on the price range of items you sell. Make it attractive enough that people will want to enter the competition. The more people who participate the more people who see your business and get to know you. An enticing prize helps attract a lot of activity on your post. The competition involvement is designed to generate interest in your business and direct people to your Facebook page (or other social media). According to Facebook rules we can not make it a condition of the competition that people like your page, but we can ask them to – at this time we have a really strong and active following who are liking and sharing a lot so it is likely that they will follow through to your page. On your page you should have a post that talks about what you sell and what you will have at the show. This will help generate interest for new shoppers. Let us know you wish to participate. (Either when you complete your application, or via email). Tell us the amount you wish your prize voucher to be. Be sure we know your social media account, especially your Facebook page if you have one. Make sure you have provided good photos we can select from to make a tempting graphic for your prize post. Be sure to indicate your participation by the deadline – we schedule these posts so we have to have a cut off date so we can schedule all the posts with enough time for everyone to have good exposure. What is the Magnolia State of Mind Magazine? The Magnolia State of Mind magazine is produced by the Mississippi Craft Show as a companion to the August MS Craft Show. Designed to showcase our talented exhibitors it is jam-packed with stories and photos. It also serves as a directory for shoppers and is a much sought-after publication. Our premier edition was overwhelmingly successful with people pre-ordering copies from all over the state and states as far away as Illinois. We simply could not distribute copies fast enough to meet the demand. Magnolia State of Mind has been produced many times since our first year and is a high-quality printed magazine, and an accompanying electronic copy is also viewable online. You may view previous editions here. Exhibitors who apply, and pay their booth fees by the due date, and who can supply any requested information by the magazine deadline will be included in the magazine for free, if we are creating a magazine for that show. This marketing alone is worth more than the cost of your booth fee. NOTE: We do not guarantee a printed magazine will be produced for every show as the ability to produce a magazine on time is determined by being able to obtain the necessary information from exhibitors in a timely manner to meet printing deadlines. Can I bring my pets to the show? The host location does not allow pets on the grounds with the exception of service animals. Does all the work I display have to be handmade? It is absolutely imperative that the work you display be your own, handmade work. We do not allow buy-sell, kits, MLM, or mass-produced products of any kind in any of our shows. Each object should have been “handmade”, “hand crafted” “hand-assembled”, or “hand-altered” by the artist or artisan him or herself. While the fundamental materials may not always built from scratch, the exhibitor/maker must have added his or her own twist to the product. Items may not be mass produced either by hand or machine. We recognize that artists and crafts people are imaginative and resourceful with varying skills, expertise and aesthetics. There is room in our community for a broad range of creative expression and techniques. We expect that supplies used in the crafting process are purchased, such as paint, canvas, fabric, thread, clay, etc. For example, an artists is permitted to paint on canvas that was purchased from a store as it is the painting that is the artwork. Some crafts incorporate both hand and machinery crafting. For example, a garment made with store-bought fabric and sewn on a sewing machine. Woodworking is a very hands-on process, though it typically includes a variety of tools that make the final products possible. If you doubt that your items fit the definition of handmade, it is likely that they are not the right fit for our show. A show may be cancelled by the promoter or host for any safety reason due to unforeseen forces of nature, (i.e., hurricanes, tornado, floods, earthquakes) if we are advised by authorities to do so for the sake of public and exhibitor safety. We do not, at any time, issue refunds. If a show is canceled after logistical and advertising arrangements have been made, we will not be able to reschedule. What is the show cancellation/refund policy? Cancellations must be made in writing or emailed prior to the show. If you cancel with the proper notice, you will retain your “exhibitor in good standing” rating which affords you early application and discounted deposit options at future shows. Application fees are non-refundable. Booth fees are not refundable. We understand that there are many unforeseen circumstances that may arise last minute, however, we cannot make exceptions to this policy. If I am accepted into one show, will I still need to apply to other shows? Since all of our shows are curated separately, you do need to apply to each one individually. Acceptance into one show does not guarantee acceptance into all shows. Each application must include photos of your work and display to be considered. Incomplete applications will be rejected. Balances are due before the show, please see your invoice for due dates. For any show that we have not received the balance due on or prior to the due date, there will be a $15.00 late fee added in addition to your show balance, with NO EXCEPTIONS. We do not accept payment at the show. If full payment is not received before the show, you may not be allowed to participate or your space may be forfeited to another exhibitor. What if I don’t have a booth display picture? A display picture is required. If you do not have one we suggest setting up a display wherever you have the room. The display photos you submit must be consistent with the booth you will set-up at the show. If it is very different and found to be unacceptable, you may be subject to removal from the show. The purpose of this is that we need to see how your set up will look in our show. YOUR DISPLAY IS JUST AS IMPORTANT AS YOUR WORK. We also need to know how your booth will look to be sure we do not place visually similar booths next to each other. I can’t upload my photos. Photos of your work must accompany your application. Photos may be uploaded when you submit your application or you may provide a link to an online album where we can see your photos. If you are having problems uploading your photos, it is likely your images are too large. If you do not have your own program to resize images, you can use this easy and free online service to resize your images before uploading them with your application. Upload your image (1 at a time) by selecting the image. Select the “dimensions” option. The width x height boxes will then display on the page. You then want to type a new size into the box corresponding to the longest side of your photo. See guide below. If your photo is portrait oriented (taller than it is wide) you will type in the height box. If your photo is landscape oriented (wider than it is tall) you will type in the width box. Once the site refreshes it will give you a link to download your resized image. Save your resized images to your computer and upload them into your application form. Where is the show being held? For address, map and directions etc to the venue please view the Getting There page. NO. The show is a 2 day event and exhibitors are required to staff their booth and remain open for both days. Booths must remain open until close of business on the final day. No exhibitor will be permitted to breakdown their booth on day 1. If you do not want to attend both days, do not apply for this show. When can I pack up after the show? It is a requirement of participation in the show that booths remain staffed and open during the show hours. Exhibitors may not begin breakdown on Saturday until 5:01 PM. An announcement will be made when you may begin packing up. Is Tax Required even for a charity booth? YES. 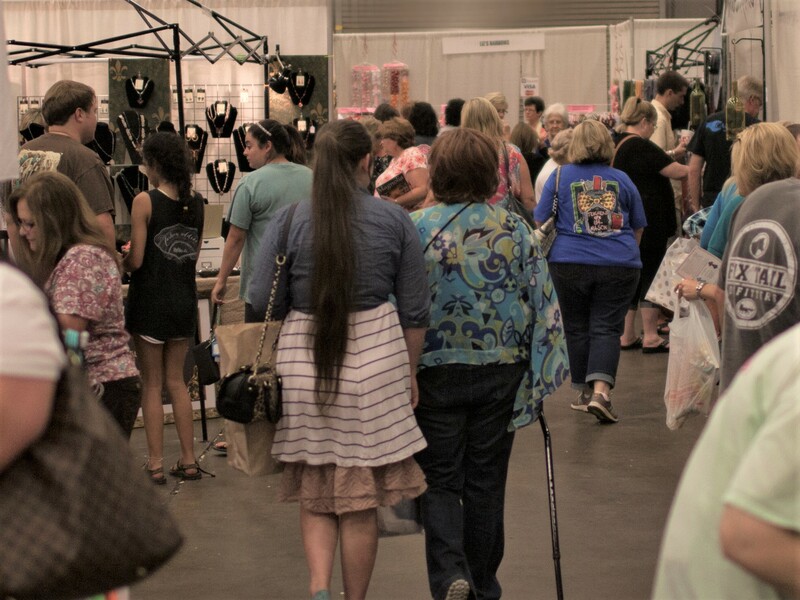 Every booth that is selling goods at the show is REQUIRED to complete the tax forms and pay applicable tax to the promoter (Mississippi Craft Show) BEFORE leaving the show on Sunday. There are NO EXCEPTIONS. If a charity is operating a booth where they are selling items and that charity is a non profit, even if they are a 501C3 – TAX MUST STILL BE PAID. Is this a flea market? 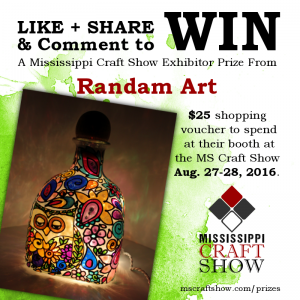 The Mississippi Craft Show’s is a retail show open to the public, not a wholesale show. This is NOT a flea market, please do not expect flea market booth fees or flea market standards. This is a curated quality event that brings serious shoppers together with quality exhibitors. We strive to maintain a friendly and fun atmosphere for exhibitors and shoppers alike, but we do require a level of professionalism and maintain quality standards for the benefit of all. Applications are open to artists, crafts people, authors, bakers/confectioners, etc, who are U.S. residents. All merchandise in the Show must be hand-crafted by U.S. artisans. No bulk/factory manufactured items allowed. This is a retail to public show. Products must be hand crafted and offered in finished form. Kits, supplies and resale merchandise is not permitted. Vinyl affixed to commercial resale items are not permitted. Vinyl affixed as a decorative component to an otherwise handmade item is permitted. MLM and other distributor type products and services are not permitted. Food Vendors: Food may be sold at the Craft Show if packaged for take home consumption. For example, toffee, honey, jams and jellies, cheese straws, cup cakes, etc are all acceptable. FOOD TRUCKS / CONCESSIONS : Please contact us if you are interested in selling concessions / food for on-site consumption. What are the PayPal fees for? Paypal charges a fee to use the service. It adds up to a substantial amount across all transactions on our end. We must recoup this small cost per transaction so that we do not eat away at our marketing and promotions budget which is paramount to the success of the show. The $25 application fee serves to offset the costs associated with administration and curating candidates. It also deters time-wasters helping to ensure we only receive applications from serious eligible exhibitors. If you are a RETURNING exhibitor in GOOD STANDING who has attended the most recent past show and you apply before the posted early-bird deadline you will be credited for the $25 application fee which will then become a part of your booth deposit. Do I need to pay tax on the sales I make at the Show? Yes. You must pay 7% state sales tax BEFORE YOU LEAVE the show on the last day. 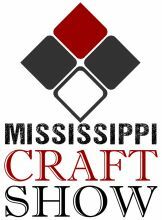 It is Mississippi State law that the MS Craft Show collect all sales tax from ALL exhibitors and submit it to the Department of Revenue. You will be provided with an official form to complete and turn in at the conclusion of the show. There are NO exceptions. Even if no sales were made. Even if the business is listed as a non profit. Please pay by check as this is your receipt. Per Department of Revenue requirements checks must be made out to Mississippi Craft Show, NOT Department of Revenue. Returned checks will be subject to a $39 return check fee. Unpaid tax will be reported to the tax department as per legal requirements. The $25 application fee is not refundable and is used to cover the administrative costs associated with curating each event. If you’re not accepted, your $75 booth deposit will be refunded. An application is a commitment to the Show refunds will only be made if you are not offered a space at the Show. If you cancel, you forfeit your spot in the show and fees will not be refunded. If I am accepted into the Show, what does my booth fee cover? First and foremost, your fee goes towards the cost of your booth space at the show. We present our exhibitors in a professional manner, this is not a flea market. In addition, our exhibitors receive a listing on our website showcase page. This listing attracts many inquiries which often turns into other opportunities, including future sales, wholesale accounts, media exposure, networking, and more. Also, exhibitors who apply by the deadline may be featured in print media and via our various social networking sites. Please note that exhibitors are responsible for supplying their own display items. Tables, chairs, etc will be available to rent through our display company once you are accepted. You will be prompted to pay the fee once your application has been submitted. All fees must be submitted via PayPal; we do not accept credit cards over the telephone. You do not need a PayPal account to submit your fee. As long as you have a debit or credit card, submitting payment via PayPal is easy. We only review paid applications. If you submit the application and do not proceed to the application fee payment you will have 3 days to complete the payment. If payment is not received within 3 business days, your application will be deleted from the system. Spaces will NOT be held without the application fee and deposit. Submitting an application and failing to make payment may prevent you from applying to the show in the future. Why is the Show juried/curated? We use the word “jury” because it is commonly used in regard to a professional show. However we believe that the term ‘curate’ is more accurate. We receive many more applications than we can accept. Because we respect our exhibitors, this is not a flea market; it is a quality, handmade craft show. We do not simply accept every applicant: We limit the number of exhibitors per category; and our makers do not have to compete with imported and mass-produced items as we only accept handmade products. We strive to maintain a high level of quality and variety in those items offered at the show, thus ensuring we do not saturate the show with any one type of craft. We receive overwhelmingly positive and highly complimentary comments regarding the quality and variety of the show, from both exhibitors and shoppers alike. We work very hard to retain the level of quality that people have come to expect from the Mississippi Craft Show. We review all complete applications and then make our choice based on several factors (see below). The overall cohesiveness and consistency of your work. If your items are made by hand, or if some of your designs are produced/manufactured elsewhere. All work must be original and made by the artist. Work should be made by hand or with the use of appropriate tools. No kits will be accepted. How your items are represented in your photos/on your website. (Your photos should not be blurry or poor quality). The number and diversity of designs or products you offer. We ask that you apply for no more than two categories per applicant. We know that many of you are extremely talented in multiple areas, but limiting your focus for this show helps us to preserve the balance among the various crafts shown and, MORE IMPORTANTLY, will help to increase your SALES! Our need to diversify the crafts available at The MS Craft Show. The jewelry and pottery category, for example, are incredibly competitive. Apply early for a chance to get a space in one of the highly sought-after categories. Please note that a limited numbers of spaces are accepted per medium (pottery, wood, jewelry, glass, etc.) as we strive to maintain a well-balanced show. 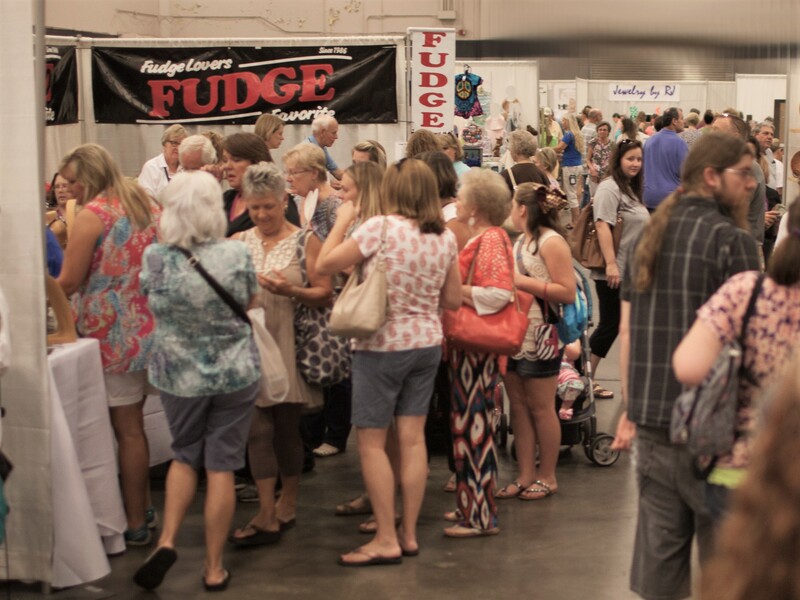 The Mississippi Craft Show reserves the right to accept or reject applications at its discretion to balance the style and content of the event for the benefit of all who attend. What if I do not have an online photo album? Or any other service you choose. Facebook albums are acceptable but you must ensure they are PUBLIC so we can see the photos. Please make sure the link you provide is a WORKING LINK. If you do not provide a working link we can not see your photos and will have to reject your application. Provide a complete link to your photos. Do not tell us to search for your username. It is your responsibility to provide the correct link. If you do not know how to copy and paste a link, visit this page to learn how. If you can not provide us with photos we will be unable to jury/curate your application as we can not see what it is that you make a wish to sell. You must fill out the application and pay a non-refundable $25 application fee and a refundable $75 booth deposit. The total due at time of application is $100 in order to be considered for a space at the Show. In the application, you will be asked to provide a link to a website where we can view photos of your work. Please provide us with a direct link to photos of your work, such as your shop, gallery, or online photo album. Booth fees increase by $50 after the early bird deadline. You can request a shared booth where two exhibitors may share a single booth, we call this our “Booth Buddy” shared booth. Both Booth Buddies (both exhibitors) must complete an application individually, be curated, and accepted to be eligible for booth sharing. All other show rules regarding exhibitor booths still apply. You must specify the name of the other exhibitor you’d like to share your booth with on your application in the Booth Buddy Name section and each must apply separately. Booth buddy shared booths are restricted to a single booth. The booth fee will be shared and each exhibitor will be invoiced for half the booth fee. There is an additional $50 fee for the booth space for a shared booth. Two exhibitor badges for each exhibitor are included. The Mississippi Craft Show does not find booth buddies for people wishing to share. It is your responsibility to find your own booth buddy if you wish to share a booth. Application Deadline: Applications should be received before the posted deadline for the best chance at securing a space. Application deadline may vary for each show, check the posted deadline for each application The Early bird Deadline is March 15th. Applications received after the posted deadline may be considered only if space is still available. Very competitive categories will have filled by this date so apply early. Booth fees increase by $40 after March 15th early bird deadline. Can I cancel the show after it is contracted? An application is a commitment to the Show, If an Exhibitor is not able to attend the Show they must submit the intent to cancel in writing. Once accepted into the Show no refunds will be offered if a cancellation is made. Once you cancel, you forfeit your spot in the show and you are not permitted to sell or trade your space. We have a waiting list and reserve the right to fill spots as we see fit. Booth fees are not refundable. Show Management is not responsible for cancellations and will not carry over balances into other events. No exceptions. Please be sure of your work schedule and family obligations before submitting an application for the show. Please be aware that you cannot give, sell, lend, share, or otherwise sublet your space to anyone else if you decide not to do a show you have paid for. You may share a booth only if both you and your booth-mate apply to the show by the deadlines published and are both are accepted. For open applications: (which means applications that are made before the published early bird deadline) – you will receive an email after the first curating session, which will be conducted very soon after the posted early bird application deadline, usually within 15 days of that posted deadline. Late Applications: After the open application deadline we will only accept further applications if space is available, and only for any category not already filled by applications made during the open application period, or if any space should become available in a previously full category. These later applications will be curated on a rolling basis. We will contact you within two weeks or less after your application. Highly competitive categories will have filled by the posted early bird deadline so it is best to apply early. Please do not contact us asking if you have been successful before our 1st curating session has taken place as a decision will not have yet been made. Should I assume that I have a booth once I submit my application? Please do not assume that you have a booth reservation until you receive a notification from us confirming that. Once you submit an online application, our system will automatically send you an acknowledgement of your application. This is an acknowledgement only, not a confirmation. We must receive the application form AND payment of fees for your application to be considered. If you are approved and accepted by the curating committee, you will receive a confirmation either by mail or email. If I submit my application online, can I be sure that the transaction is secure? Our site uses PayPal for our on-line payment processor. PayPal has a SSL (Secured Sockets Layer) Certificate which establishes a secure connection between your computer and their payment server. Encryption translates your confidential information into a code that only the PayPal server can read. This is the most effective way to ensure that your information is protected. Check-in and Set-up are not the same thing and times for each differ. Please read carefully. CHECK-IN: Upon arrival to the venue, BEFORE UNLOADING – Exhibitors must sign in and pick up their information packet. Friday: 6am – 10:00 am. Check in desk closes at 10:00 a.m., Friday. If an Exhibitor has not checked in at the Show Check In desk at the venue by 10:00 a.m., the booth and booth fee will be forfeited. Exceptions may be given to Exhibitors who have arranged in advance with the Show Management for an extended time, or those who call with a legitimate emergency. Thursday: 3pm – 7 pm. Friday: 6am – 11: 45 am. SET UP: Set up begins at 3:00 p.m. Thursday. Unload your vehicle as rapidly as possible and then remove it from the loading area immediately BEFORE YOU BEGIN SETTING UP YOUR BOOTH. Set up ends 7:00 p.m. Thursday and begins again at 6am Friday. On FRIDAY Exhibitors may enter the exhibitor area from 6:00 a.m. Set up must be complete by 11:45 a.m. Doors open to the public at NOON. It is a condition of acceptance to the Show that you abide by the Show’s Code of Conduct, so please be respectful of other Exhibitors when setting up. MOVE YOUR VEHICLE as soon as possible once you have unloaded. Friday: NOON – 6:00 pm. Exhibitors will be able to set up Thursday afternoon and Friday morning. Please refer to the ‘When Can I Move In” FAQ for specific times. How is the show advertised? Our advertising consists of the best possible media coverage for the show using multiple methods. The advertising may include Mississippi TV stations, newspaper ads, direct mail, email blasts, press releases, on-line marketing and social media, etc. We are highly motivated to do everything in our power to see that we get a good crowd of qualified shoppers as we have done in the past and will continue to do for each show. Can I rent tables and chairs? Tables and chairs are available for rent prior to the show. You will be given the opportunity to order tables and chairs and electricity if you need these booth services. Booth services must be ordered at least a week before the show. Please take note of any posted deadlines for booth services. You are welcome to bring your own tables and chairs. Lawn/garden chairs that fold up and store in a bag or plastic molded yard chairs are not permitted. Chairs must be clean and presentable. Chairs are available for free but must be ordered ahead of time, please use the booth services form. Each exhibitor is responsible for table covers. They must cover the tables on all visible sides, and they must reach the floor. We do not have a rule on color for table covers. If you order tables and chairs, they will be in your booth when you arrive provided that you reserve them by the posted deadline. Do you provide any display equipment? No. You are renting floor space only. Each exhibitor is to provide any display that they might need for the appropriate presentation of their work. You may bring your own tables and display items. You will have the option to rent 6 or 8 foot tables should you need them prior to the show. Chairs and 5 foot tables are available for free but must be ordered ahead of time. Please use the “booth services order form”. wall). These type of booths are located within the main show floor area in the middle rows. Perimeter Booths may only have one side open to walkway. The sides and back are flanked by a neighbor (OR a wall). Occasionally a perimeter booth is also a corner booth. Perimeter Aisle booths are on the perimeter of the show floor layout in the outer aisles. They are not all backed by a wall, as the row facing the wall booths are also perimeter aisle booths. Corner booths have 2 sides of open access to the walkway. These type of booths are located within the main show floor area in the middle rows. Some may also be a perimeter booth. Shared Booth: A shared booth is a single regular booth as described above but it is shared by 2 exhibitors. If you are interested in a shared booth please contact us for availability. Restrictions apply. Both exhibitors must apply individually and be accepted to the show. There is also a $50 shared booth fee added to the booth cost. Multiple Booths: Extra booths may be purchased to make your space double or larger in size. All booths are indoors and are professionally piped and draped.